How can an information security professional keep up with all of the hacks, attacks, and exploits on the Web? One way is to read Hacking Web Apps. The content for this book has been selected by author Mike Shema to make sure that we are covering the most vicious attacks out there. Not only does Mike let you in on the anatomy of these attacks, but he also tells you how to get rid of these worms, trojans, and botnets and how to defend against them in the future. Countermeasures are detailed so that you can fight against similar attacks as they evolve. Even if you don’t develop web sites or write HTML, Hacking Web Apps can still help you learn how sites are attacked—as well as the best way to defend against these attacks. Plus, Hacking Web Apps gives you detailed steps to make the web browser – sometimes your last line of defense – more secure. More and more data, from finances to photos, is moving into web applications. How much can you trust that data to be accessible from a web browser anywhere and safe at the same time? Some of the most damaging hacks to a web site can be executed with nothing more than a web browser and a little knowledge of HTML. Learn about the most common threats and how to stop them, including HTML Injection, XSS, Cross Site Request Forgery, SQL Injection, Breaking Authentication Schemes, Logic Attacks, Web of Distrust, Browser Hacks and many more. Information Security professionals of all levels, web application developers, recreational hackers. Mike Shema develops web application security solutions at Qualys, Inc. His current work is focused on an automated web assessment service. Mike previously worked as a security consultant and trainer for Foundstone where he conducted information security assessments across a range of industries and technologies. His security background ranges from network penetration testing, wireless security, code review, and web security. He is the co-author of Hacking Exposed: Web Applications, The Anti-Hacker Toolkit and the author of Hack Notes: Web Application Security. In addition to writing, Mike has presented at security conferences in the U.S., Europe, and Asia. 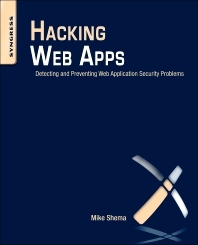 Web Application Security Solutions, Qualys, Inc.
"Hacking Web Apps by Mike Shema introduces novice security practitioners to the most threatening exploits plaguing modern web applications. The book covers more than the raw concepts, by bringing in other vulnerabilities and showing how the various exploits relate to one another; and it does so in human readable terms." --Robert Hansen, CEO of Falling Rock Networks and SecTheory Ltd.